Spring storms are back in the forecast as warm, humid air has overtaken the middle of the country and a developing low pressure system is set to move through. The warning shot will come on Monday with some unsettled weather in Chicago and some nearby surrounding cities. The greatest threat at the start of the week is most likely going to be some strong winds and large hail. By Tuesday, however, only seeing large hail and strong winds is a best case scenario. 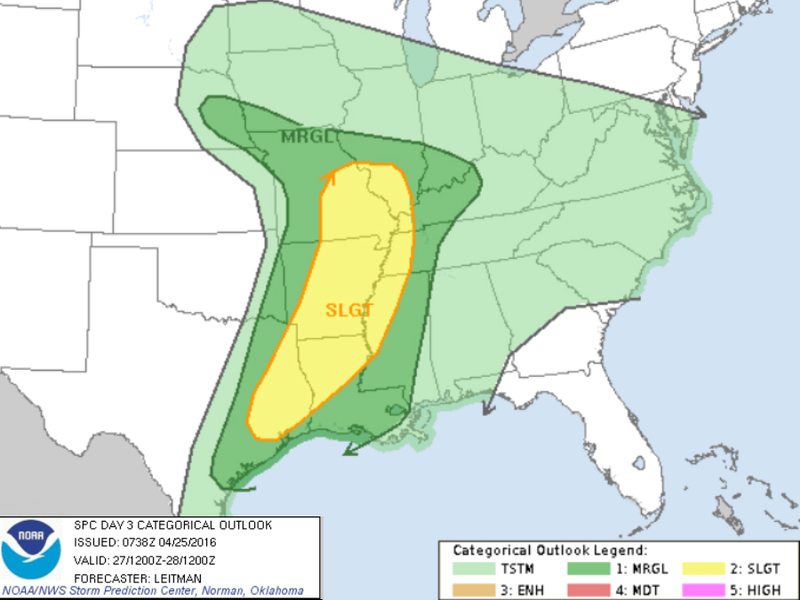 More than likely, the central United States is going to see a number of tornadoes, and according to the Storm Prediction Center's latest thoughts, some of which will be strong. 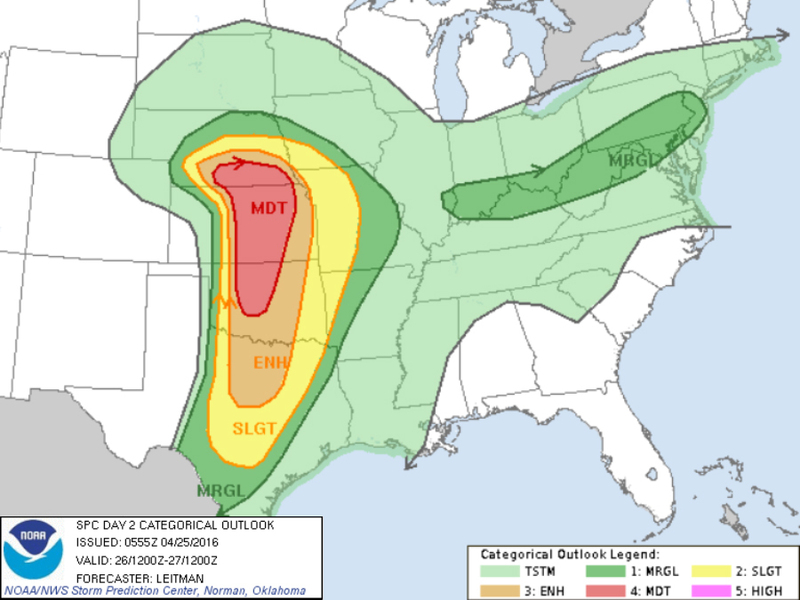 The SPC has already issued a moderate risk from Nebraska to Oklahoma and that could easily get elevated to a high risk — the highest threat level — by Tuesday morning. The possibility of tornadoes will be the greatest during the late afternoon hours on Tuesday, especially along the Kansas-Nebraska border. That threat of tornadoes will also decrease as the day wears into the night time hours. 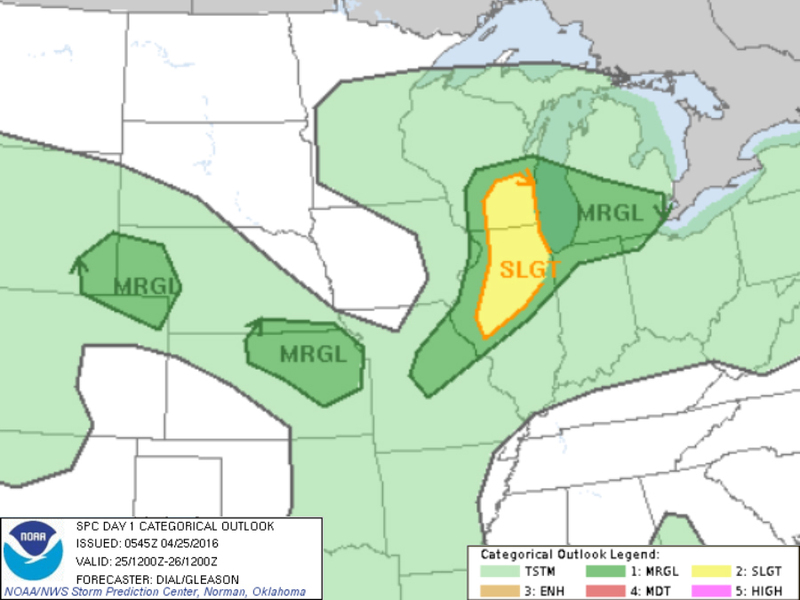 The threat of severe weather shifts east and weakens on Wednesday. This system will bring thunderstorms capable of strong winds and hail to parts of Illinois, Missouri, Arkansas, Louisiana and east Texas. If it hasn't been made clear already, the spring storm season is here, and it's important to pay attention to forecast as well as watches and warnings . The Storm Shield App can notify you of those life-saving watches and warnings as soon as they're issued, giving you the most time possible to get to a safe place no matter when the bad weather strikes.